Let’s talk about my favourite way to kickstart your day in a healthy way. Whaddaya say? Okay, enough of that. I’m talkin’ smoothies ladies and gents! Vitality-giving greens, supercharged superfoods and oh-so-important hydration all in a simple slurp! What more could you ask for? Especially when you can pour it into a jar, secure the lid and head straight out the door. Whether you’re looking for a healthy fast food breakie for a busy morning, a body-nourishing icy treat to curl up with in your reading nook, or you’re just downright lazy and can’t be arsed doing much more than scoop + blitz + guzzle — smoothies are the way forward. Sing it! Folks assume that smoothie alchemy is tricky; that having the right ingredients and coming up with happy combos is difficult. It’s not! All you have to do is start collecting your favourite superfoods from your local health food store. They may seem expensive at first but keep in mind you only use a tsp or a tbsp at a time so they last a lot longer than you think. The next trick is to always keep peeled, frozen bananas in sandwich bags in your freezer. Always keep a couple of litres of coconut water in your fridge. Then all you have to do is keep topping up your fruit bowl with fresh seasonal fruit and keep topping up your crisper with fresh leafy greens, or better still, grow them in your garden! Once you’re all set up, you’re shooting from the hip when it comes to your morning smoothies. One of the major players on any smoothie shopping list is a killer vegan protein powder. 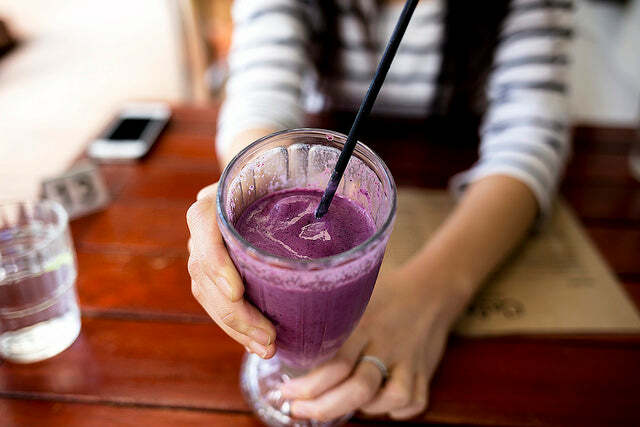 Your choice of vegan protein powder can be the difference between a delicious protein-packed slurpathon and a chalky mess you feel like you need to clean your teeth after. Some protein powders not only taste chalky, they are also riddled with fillers and artificial sweeteners and preservatives. Ain’t nobody got time for that. 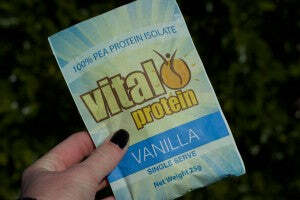 Vital Protein Vanilla (from golden peas) has been my favourite protein powder for years and if you are one of the lucky duckies who got yourself a Vegan Box this month then you should have a sachet in your hot little hands. Here’s a couple of recipes for you to try it out. Happy slurping homies. Blend it like Beckham. Slurp. Top with Loving Earth’s cacao nibs and activated buckinis. 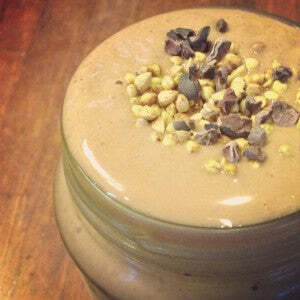 I woke up one morning with a horrid gym hangover and an acute case of crankiness so this smoothie was born. It’s packed full of protein for aching muscles, plus some mood enhancers and energy boosters to ease the morning grumps. Blend it like Beckham. You’ll need the ‘bashing stick’ (as I’ve affectionately dubbed the tamper stick). 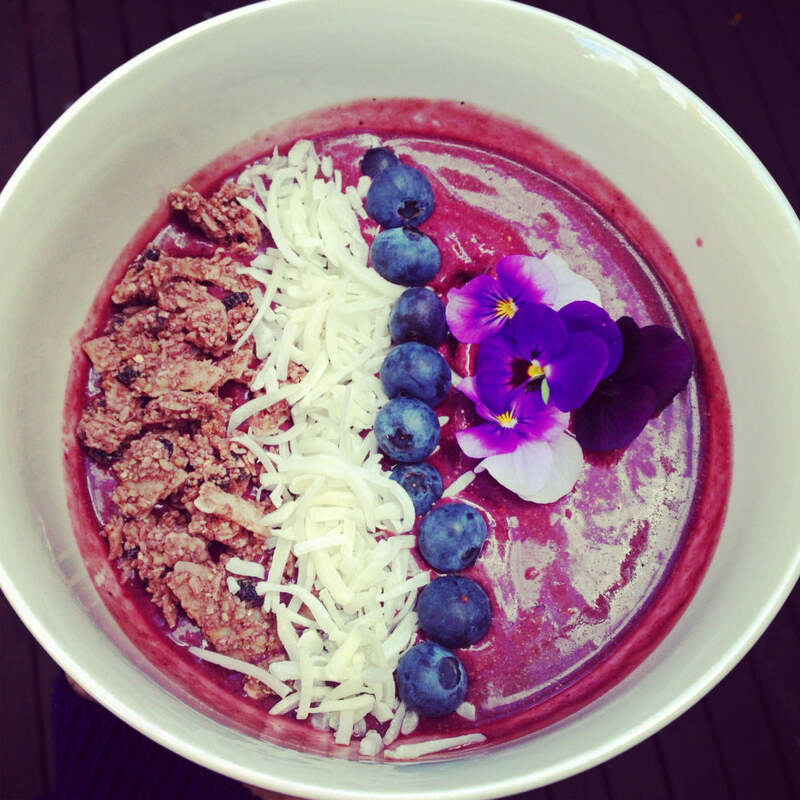 Pour into two bowls and top with violas, shredded coconut, and Living Intention’s raw superfood cereal in Açaí Blueberry (amazingly delish combo of goodies including açaí, blueberry, bilberry, amla berry, elderberry and camu camu fruit). One bowl of this and you’ll feel like you can do anything — including donning a bikini and busting some crims.